Alice Malsenior Walker (born February 9, 1944) is an American author and activist. She wrote the critically acclaimed novel The Color Purple (1982) for which she won the National Book Award and the Pulitzer Prize for Fiction. Walker was born in  Walker supports the Boycott, Divestment and Sanctions campaign against Israel. In 2012, Walker refused to authorize a Hebrew translation of her book The Color Purple, citing what she called Israel's "apartheid state." In an article for The Guardian, Walker explained her involvement in the Gaza flotilla, saying that “during this period of eldering it is good to reap the harvest of one's understanding of what is important, and to share this, especially with the young.” She also compared herself and her fellow flotilla members to Gandhi and his followers. Elisheva Goldberg, writing in the Daily Beast in July 2012, rejected the argument that Walker's refusal to allow the translation made her an anti-Semite. Noting that Walker was married to a Jew, that Walker has a half-Jewish daughter, and that The Color Purple itself was made into a film directed by a Jew, Steven Spielberg, Goldberg stated: “Alice Walker is not boycotting Jews. She is not even boycotting Israelis. She is boycotting the government of Israel. She is boycotting what she sees as state-subsidized symbols of racism that remind her of Apartheid South Africa.” To call Walker an anti-Semite, Goldberg claimed, was to “devalue” the experience of her, Goldberg's, grandfather at Treblinka. The Anti-Defamation League described The Cushion in the Road, her 2013 book on meditation, as antisemitic. "She has taken her extreme and hostile views to a shocking new level, revealing the depth of her hatred of Jews and Israel to a degree that we have not witnessed before. Her descriptions of the conflict are so grossly inaccurate and biased that it seems Walker wants the uninformed reader to come away sharing her hate-filled conclusions," the ADL wrote. Walker posted an open letter to singer Alicia Keys in May 2013, asking her to cancel a planned concert in Tel Aviv. “I believe we are mutually respectful of each other’s path and work,” Walker wrote. “It would grieve me to know you are putting yourself in danger (soul danger) by performing in an apartheid country that is being boycotted by many global conscious artists.” Keys rejected the plea. In June 2013, Walker and others appeared in a video showing support for Chelsea Manning. In May 2013 Walker expressed appreciation for the works of David Icke. On BBC Radio 4's Desert Island Discs she said that Icke's book Human Race Get Off Your Knees (in which Icke claims that Earth's moon is actually a “gigantic spacecraft” transmitting “fake reality broadcast[s]...in much the same way as portrayed in the Matrix movie trilogy") would be her choice if she could have only one book. Walker also praised this book on her website, stating that upon reading the book she "felt it was the first time I was able to observe, and mostly imagine and comprehend, the root of the incredible evil that has engulfed our planet." Jonathan Kay of the National Post argued that Walker's public praise for Icke's book was “stunningly offensive” and that by taking it seriously she was disqualifying herself "from the mainstream marketplace of ideas." In 1965, Walker met Melvyn Rosenman Leventhal, a Jewish civil rights lawyer. They were married on March 17, 1967, in New York City. Later that year the couple relocated to Jackson, Mississippi, becoming "the first legally married inter-racial couple in Mississippi". They were harassed and threatened by whites, including the Ku Klux Klan. The couple had a daughter Rebecca in 1969. Walker and her husband divorced in 1976. In the mid-1990s, Walker was involved in a romance with singer-songwriter Tracy Chapman: "It was delicious and lovely and wonderful and I totally enjoyed it and I was completely in love with her but it was not anybody's business but ours." Walker wrote, "At one point I learned Transcendental Meditation. This was 30-something years ago. It took me back to the way that I naturally was as a child growing up way in the country, rarely seeing people. I was in that state of oneness with creation and it was as if I didn't exist except as a part of everything." Beauty in Truth, a documentary film about Walker's life directed by Pratibha Parmar, premièred in March 2013. ^ a b From 1980 to 1983 there were dual hardcover and paperback awards of the National Book Award for Fiction. Walker won the award for hardcover fiction. ^ "Alice Walker". Desert Island Discs. 19 May 2013. BBC Radio 4. http://www.bbc.co.uk/programmes/b01shstm. Retrieved 2014-01-18. ^ a b "National Book Awards - 1983". National Book Foundation. Retrieved 2012-03-15. ^ a b "Fiction". Past winners and finalists by category. The Pulitzer Prizes. Retrieved 2012-03-17. ^ Logue, Victoria and Logue, Frank (1997). Touring the Backroads of North and South Georgia. Winston-Salem NC: John F. Blair. p. 165. ^ a b World Authors 1995-2000, 2003. Biography Reference Bank database. Retrieved 2009-04-10. ^ Walker, Alice (May 6, 2010). "Alice Walker". ^ White, Evelyn C. (2004). Alice Walker: A Life. New York: W.W. Norton. pp. 14–15. ^ Gussow, Mel (December 26, 2000). "Once Again, Alice Walker Is Ready to Embrace Her Freedom to Change". The New York Times. p. E1. 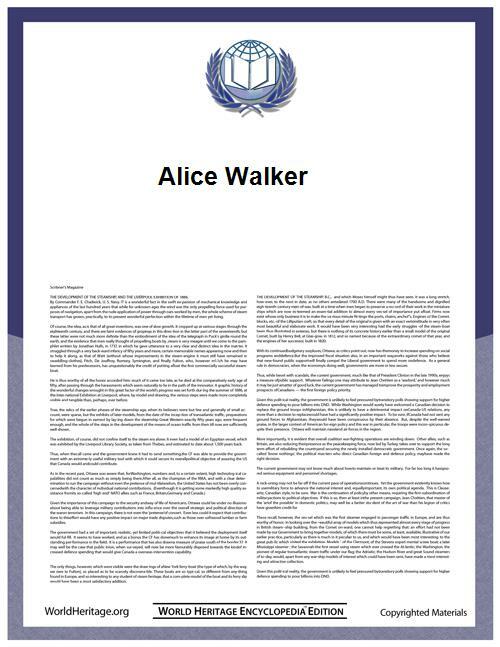 ^ Walker, Alice (2006). "Beauty: When the Other Dancer is the Self". Kingsberry. Retrieved 2012-08-29. ^ . Interview by Evelyn C. White.On Finding Your Bliss October 1998. Retrieved 2007-06-14. ^ Miller, Monica (17 December 2012). "Archaeology of a Classic". News & Events. Barnard College. Retrieved 14 June 2014. ^ Walker, Alice (3 October 2003). "Finding a World that I Thought Was Lost: Zora Neale Hurston and the People She Looked at Very Hard and Loved Very Much". The Scholar & Feminist Online. The Barnard Center for Research on Women. Retrieved 14 June 2014. ^ Anything We Love Can Be Saved: A Writer's ActivismExtract from Alice Walker, , The Women's Press Ltd, 1997. ^ "Black Book Publishers in the United States". The African American Experience. ^ Justice, Elaine (December 18, 2007). "Alice Walker Places Her Archive at Emory" (Press release). Emory University. ^ "About". Alice Walker's Garden. ^ Democracy Now - Walker Interview transcript and audio file on "Inner Light in A time of darkness". Retrieved 2010-02-10. ^ Democracy Now video on the African American Vote. Retrieved 2010-02-10. ^ "Global Women Launch Campaign to End Iraq War" (Press release). CodePink: Women for Peace. January 5, 2006. Retrieved 2010-02-12. ^ Walker, Alice (November 5, 2008). "An Open Letter to Barack Obama". The Root. Retrieved 2010-02. ^ Brown, Barry (September 5, 2009). "Toronto film festival ignites anti-Israel boycott". The Washington Times. Retrieved 2012-08-01. ^ "Book Review: "The Cushion in the Road" by Alice Walker". Anti Defamation League. Jun 18, 2013. ^ "The best place one could be on Earth". Electronic Intifada. Jul 24, 2009. ^ "Antisemitism With a Literary Glow: Alice Walker’s Ugly Caricature of Israeli Jews". The Algemeiner. Jun 24, 2012. ^ Gaza Freedom March. Retrieved 2010-02. ^ Harman, Danna (June 23, 2011). "Author Alice Walker to take part in Gaza flotilla, despite U.S. warning". Haaretz (Tel Aviv). Retrieved 2012-08-01. ^ Urquhart, Conal (June 26, 2011). "Israel accused of trying to intimidate Gaza flotilla journalists". The Guardian (London). ^ a b "Interview with Alice Walker". Foreign Policy. June 23, 2011. ^ "Alice Walker: Why I'm sailing to Gaza". CNN. June 21, 2011. ^ "Americans Are Joining Flotilla to Protest Israeli Blockade". New York Times. ^ "Interview: Alice Walker". Foreign Policy. ^ "Tiberias" (May 11, 2013). "Palestinians in Israel: Boycotting the boycotters". The Economist (London). ^ "Alice Walker says no to Hebrew ‘Purple’". Times of Israel. June 19, 2012. ^ "Alice Walker: Why I'm joining the Freedom Flotilla to Gaza". The Guardian. 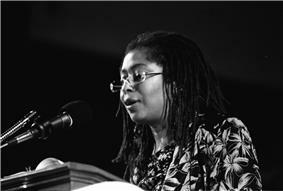 ^ "Alice Walker’s bigotry". Jerusalem Post. ^ "Alice Walker Is Not An Anti-Semite". Daily Beast. ^ "Book Review: "The Cushion in the Road" by Alice Walker: Anti-Semitic and Extreme Anti-Israel "Meditations" Permeate Walker's Latest Book". ^ Koren, Daniel (Jun 22, 2013). "'"Alice Walker book deemed 'anti-Jewish. ynet News. 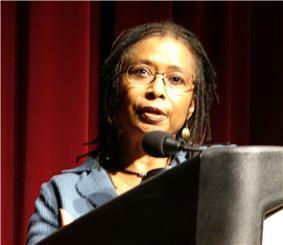 ^ ADL: Alice Walker ‘unabashedly infected with anti-Semitism’, Times of Israel, June 18, 2013. ^ "ADL: Alice Walker ‘unabashedly infected with anti-Semitism’". Times of Israel. ^ "Alice Walker disinvited from University of Michigan over ‘Israel comments’". Electronic Intifada. ^ "Despite Protests, Alicia Keys Says She Will Perform in Tel Aviv". New York Times. ^ Gavin, Patrick (Jun 19, 2013). "Celeb video: ‘I am Bradley Manning’". Politico. ^ "I am Bradley Manning". YouTube. ^ a b Walker, Alice (December 2012). "Commentary: David Icke and Malcolm X". Alice Walker's Garden. ^ O'Brien, Liam (May 19, 2013). "Prize-winning author Alice Walker gives support to David Icke on Desert Island Discs". The Independent on Sunday (London). ^ Walker, Alice (July 2013). "David Icke: The People’s Voice". Alice Walker's Garden. ^ "Desert Island Discs: Alice Walker". BBC Radio 4. May 19, 2013. ^ Walker, Alice (2013). "Human Race Get Off Your Knees: I couldn't have put it better myself". ^ "Jonathan Kay: Where Israel hatred meets space lizards". National Post. ^ Driscoll, Margarette (May 4, 2008). "The day feminist icon Alice Walker resigned as my mother". The Times (London). ^ "Inner Light in a Time of Darkness: A Conversation with Author and Poet Alice Walker". ^ Krum, Sharon (May 26, 2007). "Can I survive having a baby? Will I lose myself ... ?". The Guardian (London). ^ Wajid, Sara (December 15, 2006). "No Retreat". The Guardian (London). Retrieved 2013-05-26. ^ "No retreat". The Guardian. ^ Reed, Wendy; Horne, Jennifer (2012). Circling faith: Southern women on spirituality. University of Alabama Press. p. 185. ^ "Alice Walker (b. 1944)". New Georgia Encyclopedia. White, Evelyn C. (2005). Alice Walker: A Life. Walker, Alice; Parmar, Pratibha (1993). Warrior Marks: Female Genital Mutilation and the Sexual Blinding of Women. Diane Books Publishing Company. It also led to a June 2011 interview in  Walker's decision to take part in the 2011 Gaza flotilla was reported in the New York Times. In March 2009, Walker and 60 other female activists from the anti-war group Code Pink traveled to NGOs and residents, and to persuade Israel and Egypt to open their borders with Gaza. She wrote about her meeting with an elderly Palestinian woman who upon accepting a gift from Walker said “May God protect you from the Jews.” Walker responded “It’s too late, I already married one.” referring to her former husband, a Jewish civil rights lawyer whom she had divorced in the 1970s. She planned to visit Gaza again in December 2009 to participate in the Gaza Freedom March. On June 23, 2011, she announced plans to participate in an aid flotilla to Gaza that attempted to break Israel's naval blockade. Explaining her reasons, she cited concern for the children and that she felt that "elders" should bring "whatever understanding and wisdom we might have gained in our fairly long lifetimes, witnessing and being a part of struggles against oppression." In January 2009, she was one of over 50 signatories of a letter protesting the Toronto International Film Festival's "City to City" spotlight on Israeli filmmakers, condemning Israel as an "apartheid regime." In November 2008, Walker wrote "An Open Letter to Barack Obama" that was published online by The Root. Walker addressed the newly elected President as "Brother Obama" and wrote "Seeing you take your rightful place, based solely on your wisdom, stamina, and character, is a balm for the weary warriors of hope, previously only sung about." In 2013, Alice Walker released two new books, one of them entitled The Cushion in the Road: Meditation and Wandering as the Whole World Awakens to Being in Harm's Way. The other was a book of poems entitled The World Will Follow Joy Turning Madness into Flowers (New Poems). In 2007, Walker donated her papers, consisting of 122 boxes of manuscripts and archive material, to Emory University's Manuscript, Archives, and Rare Book Library. In addition to drafts of novels such as The Color Purple, unpublished poems and manuscripts, and correspondence with editors, the collection includes extensive correspondence with family members, friends and colleagues, an early treatment of the film script for The Color Purple, syllabi from courses she taught, and fan mail. The collection also contains a scrapbook of poetry compiled when Walker was 15, entitled "Poems of a Childhood Poetess." Walker has written several other novels, including The Temple of My Familiar and Possessing the Secret of Joy (which featured several characters and descendants of characters from The Color Purple). She has published a number of collections of short stories, poetry, and other writings. Her work is focused on the struggles of black people, particularly women, and their lives in a racist, sexist, and violent society. Walker is a leading figure in liberal politics. Walker is the co-founder of Wild Tree Press, a feminist publishing company in Anderson Valley, California. She and fellow writer Robert L. Allen founded it in 1984. In 1982, Walker published what has become her best-known work, The Color Purple. The novel follows a young troubled black woman fighting her way through not just racist white culture but patriarchal black culture as well. The book became a bestseller and was subsequently adapted into a critically acclaimed 1985 movie as well as a 2005 Broadway musical. Walker's first book of poetry was written while she was a senior at Sarah Lawrence. She took a brief sabbatical from writing while working in Mississippi in the civil rights movement. Walker resumed her writing career when she joined Ms. magazine as an editor before moving to northern California in the late 1970s. Her 1975 article "In Search of Zora Neale Hurston", published in Ms. magazine, helped revive interest in the work of Zora Neale Hurston. Hurston inspired Walker's writing and influenced her subject matter. In 1973, Walker and fellow Hurston scholar Charlotte D. Hunt discovered Hurston's unmarked grave in Ft. Pierce, Florida. The women chipped in to buy a modest headstone for the gravesite. On March 17, 1967, she married Melvyn Roseman Leventhal. She worked as writer in residence at Jackson State College (1968–1969) and Tougaloo College (1970–1971) and was a consultant in black history to the Friends of the Children of Mississippi Head Start program. In 1952, Walker was accidentally wounded in the right eye by a shot from a BB gun fired by one of her brothers. In 2013, on BBC Radio's Desert Island Discs, she said the act was actually deliberate but she agreed to protect her brother against their parents' anger if they knew the truth. Because the family had no car, the Walkers could not take their daughter to a hospital for immediate treatment. By the time they reached a doctor a week later, she had become permanently blind in that eye. When a layer of scar tissue formed over her wounded eye, Alice became self-conscious and painfully shy. Stared at and sometimes taunted, she felt like an outcast and turned for solace to reading and to writing poetry. When she was 14, the scar tissue was removed. She later became valedictorian and was voted most-popular girl, as well as queen of her senior class, but she realized that her traumatic injury had some value: it had allowed her to begin "really to see people and things, really to notice relationships and to learn to be patient enough to care about how they turned out". After high school, Walker went to Spelman College in Atlanta on a full scholarship in 1961 and later transferred to Sarah Lawrence College, graduating in 1965. Walker became interested in the U.S. civil rights movement in part due to the influence of activist Howard Zinn, who was one of her professors at Spelman College. Continuing the activism that she participated in during her college years, Walker returned to the South where she became involved with voter registration drives, campaigns for welfare rights, and children's programs in Mississippi. Growing up with an oral tradition, listening to stories from her grandfather (who was the model for the character of Mr. in The Color Purple), Walker began writing, very privately, when she was eight years old. "With my family, I had to hide things," she said. "And I had to keep a lot in my mind." Living under Jim Crow laws, Walker's parents resisted landlords who expected the children of black sharecroppers to work the fields at a young age. A white plantation owner said to her that black people had "no need for education". Minnie Lou Walker, according to her daughter, replied "You might have some black children somewhere, but they don't live in this house. Don't you ever come around here again talking about how my children don't need to learn how to read and write." Her mother enrolled Alice in first grade when the girl was four years old.